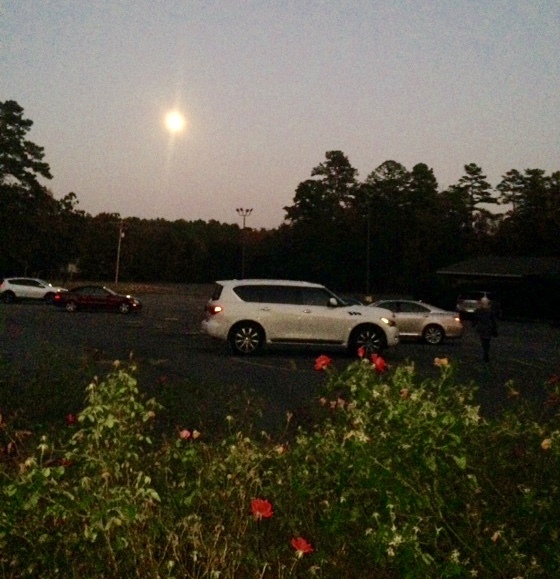 This quick snapshot of the full moon turned out to be a bit of an oracle image for full moon in Taurus. Note the roses! I did not see the flowers when I took the picture. I was gazing at the moon. Venus has domain over beauty and rules Taurus. Roses are not only exquisite . . . they smell so good! Taurus is the sign of the senses and earthly delights. Taurus is the sensate experience of physical life. Venus and Taurus also connect us with what we value and with money. The snapshot has shiny vehicles reflecting the moonlight. We like nice things. Taurus is about acquisition. The opposite sign, Scorpio, is about complexity and transformation. The dark spots of the photo (the nightscape) are the Scorpio part of the polarity. Scorpio contains mysteries and hidden information. Every month we welcome a full moon in the sign opposite the Sun. This month the Sun sits in Scorpio and the moon is full in Taurus. Taurus helps us stay grounded by connecting us with our physical body and our sensual experiences. Scorpio pushes us into complexity and uncertainty. Is everything exactly as it seems? Is everything ok? Is life a concrete experience? Hardly. Life is a magical essay, full of beautiful experiences and painful losses. Taurus rules holding on, Scorpio rules letting go. During this full moon period we are faced with the polarity of having what we want and not having what we want. Sometimes we experience this through relationship. We think we know a person because we have tangible experiences of that person. Then something happens and we realize we don’t know that person. For some people relational exchange is more complicated than sharing a good meal. The Taurus full moon experience wants to focus on the fine wine and chocolate while the Scorpio Sun is questioning what it all means. Staying balanced in this polarity is the trick. Honor the sensate and be grateful for the physical manifestation of beauty, love and abundance. Also, honor the Scorpio mystery, but don’t drown in the mystery. Don’t fear the loss so much that you miss the breathtaking beauty of the night and of the day.